It’s been 11 years since I wrote the original article about Export Mokes, and that was written in a hurry. This was my first non-technical venture hence it wasn’t saturated with references. However, as the years passed, I have collected a variety of additional data. Nothing overwhelming but enough to justify sorting out the five additional supplements this generated. I still haven’t found that conclusive piece of BLMC-Australia paperwork that states these vehicles were intended specifically for North America or anywhere else. In this same time I certainly haven’t found anyone else even coming close to the detail of my previous work. Just to avoid any confusion or to impose it early, any referral to Export Moke (Export…) is the vehicle to which this article represents. This should not be confused with any other reference to Mokes that were intended for export, actually exported or locally-delivered Mokes that subsequently found their way overseas. We must, of course, remember that the Moke was sent abroad before and after this period, new, from Zetland or Enfield – in most cases it was the normal Australian version, if required, with the steering wheel on the other side. Destinations for new Australian-made Mokes include the Republic of South Vietnam, New Zealand and Pitcairn Island. Inadvertently, this revised paper created more questions than it sought to answer. 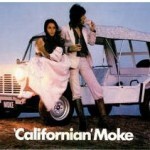 At the beginning of the 1970s BLMC Australia had started to realise that Moke could be better marketed. As a result, the Moke’s well-publicised commercial aspects were to be overlooked in favour of recreational use. Up to this point the first two models of big-wheel Moke had been advertised in the same way as Land Rover and other small commercials and were usually pictured in a rural or business situation. However, by time production could start, pending changes to overseas design rules appear to have dashed hopes of mass exportation. A few cars did manage to make it to foreign shores. But for the majority, the local market was about to receive a strangely-equipped Moke which would compete directly with the existing product. At this time Australian local content had or was about to peak – in addition to the expected panels, items such as road wheels, steering wheels, seats, trim, lower suspension arms, trailing arms, rear hubs, stub axles, and most of the electrics were made in Australia. Others parts, including top suspension arms, engines and boxes bore local content and assembly. For the interested members of the Moke community, this new model would become known simply as ‘Export’. Camgears/TRW Australia Mini steering rack. In most instances, Export has the later feature. For 1974 (the very end of this story) Australia took another step towards metrication. MPH speed signs were progressively changed to KPH but the Australian Moke never seems to have been issued a dual-reading speedometer. Somewhere along the way, a metric Smiths Australia (grey-faced) speedometer for the big-wheel Moke was introduced. A couple of years further down the track and well after the Export, the Australian Moke was assembled with a Smiths (UK) speedometer (black-faced, black bezel), once more KPH only. This is what most people are referring to when talking about the Export Moke. Vehicles that were sold new in Australia, for registration and road use in Australia had right hand drive, left hand dip headlights and bore an Australian Compliance Plate. Some of these cars subsequently moved overseas. As for any Australian-delivered car at the time, an aluminium Compliance Plate was fitted. This stated basic details such as manufacturer, body code and serial number, vehicle mass, seating capacity and the Australian Design Rules to which the vehicle met on the day the plate was affixed. As with Compliance Plates, BLMC-A had introduced most items to the production line long before it was a mandatory feature. Waist seat belts for both front seats. Much of this was achieved by simply parts bin shopping from existing LA and BL production lines. ‘New’ electrics consist of Midget sidelights, reintroduced Lucas L594s, plus new, larger front and rear indicators and Lucas, red, rear reflectors. 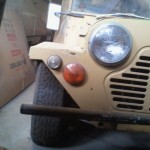 The big-wheel Moke already had wheel arch extension panels to adapt the ten-inch body. To accommodate the new side lights and reflectors, deeper wheel arch extension panels and extended rear wheel arches were created. A Lucas aftermarket accessory (pull) hazard switch was mounted under the dash and incorporates the additional flasher unit. This switch is the same style as used on Triumph 2500, Range-Rover etc. The fuse box is also listed as being inside the car. The otherwise standard tow bar was now deleted creating a special rear bumper. Winter treads were replaced by road use tyres though still only conventional ply. Rear passenger grab handles are standard, regardless of only front seats being fitted. The new fuel tank (Midget) was fitted to the underside of the boot floor with filler neck now adjacent to the spare wheel – essentially the fill point is outside the occupant area. The large hole for the traditional side tank wasn’t pressed. However, the vacant space now created, wasn’t utilised either. Two more useful companion boxes could have been easily introduced but weren’t. An SU electric fuel pump was used and this to may have stemmed from USA requirements for pump location etc. The driver’s handbook lists the engine size as 1274.86 cc – somewhat unusually precise. This model did have drum brakes all round. Again somewhat unusual as in most other Leyland products, the 1275cc installation required a matching disc brake upgrade. How the Export passed Australian Design Rules (ADR) with all round drum brakes is anyone’s guess. Obviously someone at Leyland Australia ticked the appropriate box and signed off on it. It would seem that the 1275cc engine was used in local cars with all the extra emission control plumbing. Air injection with 1.5 inch SU was, of course standard. Such emission control wouldn’t otherwise be seen in Australia, until July 1976. 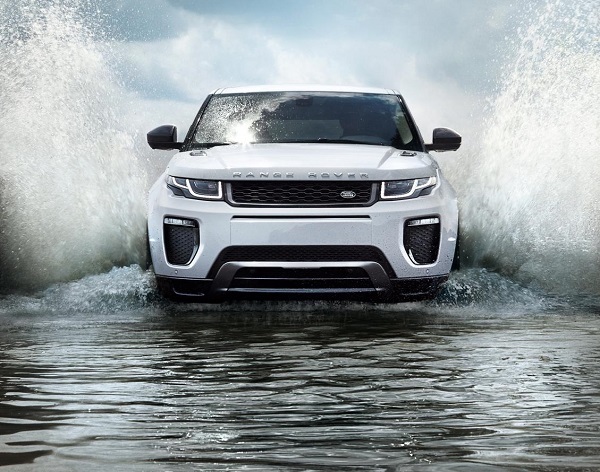 Therefore you might have expected a complete engine or power unit purchased from the UK solely for this model. Strangely, there doesn’t seem to be any mention of a catalytic convertor or cylinder head valve seat inserts. For Exports with the windscreen frame in the same colour as the body, the steering wheel will also be colour matched. Otherwise, the car was generally as per the Australian model; steel frame seats with lashed/slip-on covers, folding roof and central speedometer with incorporated fuel gauge. 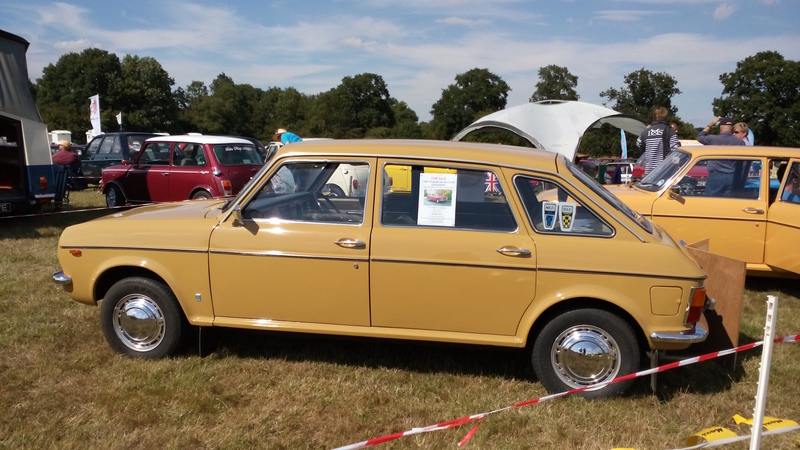 Badging was nothing more than a single pressed aluminium plate stating ‘Moke’ situated between the headlights. A cast zinc BL sill badge was placed above – that was undoubtedly to give international product association. The sill badge and most of the so-called ‘special’ parts for the Export weren’t special, as has already been identified. Apart from the panels, all the critical bolt-on parts came straight off the shelf. Basic colours (Crystal White, Jet Red…) were undoubtedly similar to international Leyland production. Duo-tone or iridescent paint wasn’t a factory feature for the Export. It’s unclear when the two patterns arrived and all three colours appear to have been available for any model. There may have been some LA prescribed colour logic (body colour Vs’ trim) but this hasn’t come to light. All three trim colours seem to work with all body colours, though black on white vinyl is probably best suited to a white car. This finish is also floral but with only the black outline of the petals – not always obvious at a glimpse. Trim would have been the easiest dealer change in order to complete a sale. Other items include twin circuit brakes and a heater. However, it may transpire that not all cars were so equipped. I certainly haven’t located any with heater nor provision for heater or screen demist. Twin circuit brakes were present on at least some vehicles and appear in the owner’s handbook – a feature that wouldn’t become mandatory the Australian home market till 1977. For the Export, the only available master cylinder would have been off the shelf from Lockheed, as per any twin circuit U.S. specification Mini. A 1960s design that also pops up on some works cars. Notable by one large, screw-on reservoir cap. Not the same as the Australian single circuit master, nor the mid-1970s Lockheed item. Of the cars I have been able to examine, the radiator shroud (part of the LH inner wing panel) has been redesigned – either to allow for the slightly larger radiator core or to address repair access issues. The top radiator bracket is also notably different to other models, having a somewhat simplistic, folded design. Optional equipment: save for body and trim colour, virtually nothing. The most significant would be rear seats, which appears to have been one of the rarest options taken up. In some Australian states, two seats meant cheaper annual registration. Technically, side curtains were still an additional purchase. The Export appears as an inclusion with various Leyland Australia promotional material. In some instances, its differences were noted in the fine print. In many cases there was no mention at all. The publicity department simply compiled something they thought appealing, without any relation to what was or wasn’t presently available. The Moke was distinct enough in itself, without worrying about detail differences in pictures. The setting, image or colour contrast would have been of more importance to those composing sales literature. As yet, I have only encountered one piece of Export specific (singular) Australasian sales literature. PR material also tends to show quirks that were never in production. Popular Export shots have cars with no badge work. The only Service Bulletin is one mentioning a dozen 14R vehicles sold off after flood damage. All were listed as 14R and as no longer having access to any warranty claims. At a glimpse, handbooks appear identical to those of concurrent normal Moke. The easiest confirmation is to skip to the back cover. Locate the document’s part number, where ‘export’ should be found to be part of the sequence. Regretfully, there isn’t a factory publication that can be relied upon for identification – certainly not one for the layperson to use. Workshop manuals contain virtually nothing in this area and parts lists have far too many errors and simply wrong information. This is supported by Australian Parts Lists (Paget 2013) and Australian Workshop Manuals (Paget 2013). For greater detail on what the coding means, refer to Australian Identification (Paget 2013). Alternately, BMC-LA Passenger Vehicle Reference (Davis/Cripps 2015). The body code and numbering system carried over from the 1960s was applied to the start of Export production. Thus, the prefix YJBAB12R is applied from a body number start point of 501. Car number 1 is car 501. ‘YJBAB’ decodes to an Australian commercial vehicle platform, in particular – Moke. The following numerals should designate evolution of the general body shape so, if a major redesign occurs, they would usually allocate the next number. This doesn’t mean models couldn’t be concurrent, as with an up-market version alongside entry level. The concurrent, ordinary (home market) Moke is 8R. The final character ‘R’ designates steering position (R = RHD, L = LHD). The 12R period starts in the second half of 1971. This replaced by 13R in early 1972, which supersedes 12R entirely. With each new code the body number sequence resets to 501. What changes were incurred with this evolution, I haven’t yet confirmed. 14R appears to be running parallel to 12R. In January 1973, L.A. introduced a new vehicle coding system. This creates the prefix: 030C0B1M12 plus the body number. Serials now start at 1001 in place of 501. There is an inference that for on-going (carry over) models, Leyland Australia simply continued on from the last body number but with the new prefix. Looking at the limited data available, this logic could be applied to Export Moke but is as yet, only conjecture. Otherwise, LA appears to have produced an awful lot of 030, very rapidly, straight after 13R ceased. Cars 1419 and 1498 both use the 030 sequence and are complianced March 1973. This appears to be the final year of production for Export. The vehicle coding sequence introduced in 1973 incorporates engine size with the last two characters. All 030 Exports I have located, finish their code with 12 (030 C0B1M 12). Indicating that a 1275 motor was fitted. No Leyland Australia product comes to mind where this part of the code didn’t reflect what was actually fitted to the vehicle. Therefore amber park lights, side markers (not side indicators), rear and side reflectors… For B and Midget, tail light lenses have their colours reversed with amber becoming the primary colour. Red is still stop but now in the smaller top position, what was the indicator position in any other market. 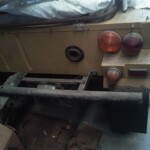 Series III Land-Rover required larger front amber lights and switch panel illumination. British Leyland still had strong sales in North America in the early/mid 1970s. Many but not all of the North American requirements have been covered so far. Reference material for any of the above vehicles in U.S. specification, is readily available and generally quite accurate. Without researching U.S. Federal, State and Territorial legislation, you will see that, compared to the above vehicles, there is an awful lot that Export Moke doesn’t have. If nothing else, the home-market Export was practise for LA in adapting product to the world’s largest automobile marketplace. As a slightly different comparison, concurrent Australian-made Japanese cars had many of these U.S. specification features as standard equipment from the poverty-pack entry level model upwards. Provision for items such as side lights were pressed in panels but fitted with blanking trim in place of the lights. All had hazard lights just like everything made in Australia didn’t. I don’t actually know that the Export was destined for the States, the American commonwealth or anywhere in North America. Certainly from the confusion emanating from former company staff, they don’t know either. However, by the type of modifications found on home market Exports, this would be a fairly logical conclusion. I can’t think of anywhere else in the world where such features would have been needed at that time. Two clear U.S.A. references of note are the wiring diagram in the Australian Mini Workshop Manual and the brochure for the period (PP5M12/70). Allowing for steering and headlights, these features weren’t included, which only adds further mystery. U.S. Federal standards may have included differences or exemptions for commercials but what would they have made of Moke? A heater is identified in the wiring diagram for this model. However, I haven’t located an Export that has one or a dash with demister provision. There should be several surviving Zetland staff that could provide serious information on the matter. As yet they haven’t been found or have been overlooked. It should also be remembered that vehicle registration within Australia was and still is controlled by the States/Territories. Uniformity isn’t always present. However, unlike many other countries, driving or registering a LHD vehicle for normal road use was generally frowned upon. The option wasn’t there for LA to offer a ready for export package to a local buyer. Delving off in to other areas, it’s unclear what LA did for steering racks on any LHD Moke. As any Australian RHD Moke uses the Australian made (thicker shaft) steering rack. Was there a LHD version or did they use something else? What a pity parts books are so poor that this can’t be answered with straightforward research? The company had been sending product overseas for years and would continue to do so. Although going here, there and almost everywhere, none of the required changes were significant. Home market Export Moke demonstrated production adaption that many other car makes had been dealing with for years. Not quite what the section title suggests… In this case I’m just focussing on one, additional, short period and not any of the other Mokes that were exported from Australia or otherwise referred to in this paper. A Service Liason Summary (SLS) from 1970 identifies a project for 300 special Mokes to fulfil an order from the United States Virgin Islands. Production is to be named Nomad and not to be confused with Morris Nomad (the hatchback version of Morris 1300/1500). Where this project goes moves into myth and mystery. I’d suggest this is what generates YJBAB11L. Body code YJBAB 11 L was specifically for the U.S. Virgin Islands. Such cars bare a U.S. Federal standards placard. Car ‘six’ was dated as December 1970 (placards are dated). Quite literally car 6 (not 506). Of more significance was that the plate was for compliance with U.S. Federal Safety Standards and the U.S. Virgin Islands. That’s the only true factory evidence I have seen for the Virgin Islands inference associated with Moke. Oddly, the car is designated ‘L’ for left hand drive. Whereas the U.S. Virgin Islands drive on the left, therefore the steering wheel on the right would be more appropriate. Maybe this would have been too confusing for local buyers? Though it certainly would have been another cost saving for BLMC-A to make more RHD Mokes. As yet I haven’t been able to find out anymore about the specifications of YJBAB 11 L. In particular, whether 11L is a YDO18 or YDO30. Because owner fantasy is rife within the area of Moke titles and specifications, I won’t speculate. A recent publication; Building Cars In Australia (Heritage Trust), states the Virgin Islands as the intended market for Export Moke. Not the first time I have read this destination but the first time from a source so close to the factory. This isn’t a book on models produced or a precise book on model identification. Most of the Minis/Mokes pictured at the end of the book are either incorrectly titled or not Zetland (Victoria Park) produced (the book focuses on Zetland production). How many cars could possibly sold in such a small market as the U.S. Virgin Islands to justify the production changes found on Export? Let alone the number of vehicles produced (12R, 13R, 14R and 030). 11L, despite being a LA creation, doesn’t appear in mainstream LA publications. Speculation probably isn’t wise but with what evidence is to hand, 11L appears to be the mystical Virgin Islands vehicle and nothing else. The rest, known as Export (12R, 13R, 14R and 030) appear to be an expansion on the ‘concept’ thus presenting Moke as a product that could be sold in the world’s largest automotive marketplace. There is a propensity for owners, repairers and some authors to parrot fables instead of applying accuracy and fact. Today, we find a lot of absolute fantasy portrayed as truth, especially with assistance of the interweb. As with countless Land Rover owners who insist that everything is a Defender, including Series III. Any Kombi with a piece of wood and foam in the back is a Campmobile. For Moke, every second vehicle is now a Californian!?! Actual facts, like the correct/legal tyre rolling diameter for a big-wheel Moke or correct/legal ride height are almost totally ignored, refuted or denied. So too, Export has inadvertently attracted some owner-myth association with the term ‘Californian’. To give some justification to those who have quoted factory documentation in the past, there are notable differences between executive decree and production. Hence the term Californian is plastered, through some company documentation and is in fact referring to Export. 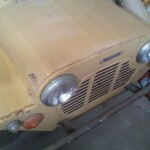 As with the standalone Australian Moke parts list (PUB1029). 13R and 14R only, are titled as Californian, with CALIFORNIAN boldly on top of every page referring to them. Which would have caused some considerable consternation after the badged Californian was introduced (circa 1976). Like many hierarchical and layered organisations, the company failed to employ fixers/fire-fighters to sort out the problems resulting from the pyramid’s structure. As already stated, the vehicle on which this paper concentrates is only badged British Leyland Moke (standard road wheels, galvanised bumpers…). For whatever reason, LA executives titled the Export as Californian. Why, appears to be lost to time. Where do you start? There doesn’t appear to be too many Exports left and many are a train-smash collection of random parts and patchwork repairs. The passing years haven’t been kind to Exports, Mokes in general and, in particular, Australian Mokes. Owner fantasy over just about any point is rife in the Moke community. As yet I haven’t encountered any definitive resource of information for Export or any Australian Moke or any Moke for that matter. Many Moke parts are unavailable. Oddly, things like side lights and reflectors for Export are plentiful and always have been. This is despite established owner delusions to the contrary. Many of the common Australian Mini parts are now unavailable such as the TRW/Camgears steering rack and its major components. Interest in Mokes doesn’t seem to have abated, though today, there is a distinct contradiction. Would-be and many present owners still imagine Moke to be cheap but, in fact, the average asking price, for a road-going Moke is well over $10000 (AUD). The further contradiction within this is that most of these high-priced Mokes would never pass a honest/accurate vehicle inspection for registration (MOT, WOF, RWC, Safety Certificate…). Collapsed suspension, missing safety features, missing emission control equipment, use of CHOKE parts and home-made modifications. Just a few of the key faults blatantly apparent on many pricey, road going Mokes offered for sale. Plus the almost classical patchwork rust repairs and over-plating with sheet steel. Export front and rear lights use a standard hole pattern. Virtually a British standard pattern. As a result, countless brands of lights (Sparto, WIPAC, Lucas… and their present day mystery brand copies) and models within those brands, will mount up to the body panel without any owner/repairer butchery. Many are extremely affordable if not cheap. Therefore no need to use mystery brand, non-compliant trailer lights as is too frequently seen. Similarly, for owners willing to put in the research, many of the correct body fittings can be found in stainless. Matching Pozidrive, mushroom head, set screws are available and more than affordable. Doing the job well, as is infrequently found on Mokes, is possible. I certainly find any unmolested Moke viable as an everyday car. Even with maintenance intervals being short and fuel economy poor, compared to a modern small car. Acceleration, top speed, handling and long-distance cruising ability is as capable as ever, in a well-maintained Moke. Front and rear legroom in a Moke is suitable for anyone up to 6ft. On long trips you will need to stop every two hours or so for fuel. This happens to coincide with the Government-recommended break time for long trips. For urban cycle, drum brakes function perfectly well but do need regular adjustment – well inside that of standard service intervals. The constant battle for certain parts too regularly becomes overwhelming and results in the car sitting for some time until the problem can be rectified – as, for example, when the trafficator breaks and all you are offered is a reproduction of the incorrect UK Mini part or something less. This can go some way to explain why many present day cars are such a collection of random parts. Trying to find a motor trimmer that understands what is quality canopy and trim, let alone one capable of copying an original without imposing their budget fantasy interpretations is difficult. Within Australia, virtually none of the common Moke replacement parts have been addressed. There are probably too few surviving untouched Export Mokes left to identify what actually occurred – that’s down to them being too cheap for too long and being the odd model in an entry level car. The vehicle manufacturer’s efforts to support its product, in this instance are appalling – not just lack of information, but a continuing trail of contradictions. Despite some truly amazing accomplishments, L.A. production records are somewhat of a mystery and that’s not just because of the Zetland factory closure in 1974. For whatever reason the Australian Mini range was relegated to a lot of quite simply half-assed supporting detail. Just ask anyone who has tried to use a Leyland Australia Mini Workshop Manual. The relevant Moke parts list (still available) having almost as many pages with ‘No Illustration’ as those that are illustrated. However, in contrast, other L.A. products such as the P76, Tasman and Morris Nomad have acceptable to excellent supporting documentation. This continues today with lack of clarity from the Heritage Group on what they actually did. Limited overseas Moke sales occurred consistently throughout Australian production, based on whatever was the current home-market model at the time. This includes adaptation for LHD destinations. This confusion, the Californian stigma, combined with the Export not having a badged name has also helped to remove the model from the roads. 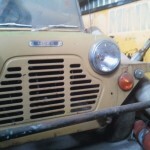 The Export Moke probably became another nail in Leyland Australia’s coffin. However, the flare and initiative to try and enter the world’s largest car market should be respected. As stated previously, the original article was written without prior research – basically straight off the top of my head, save for a couple of points. Rereading this several years later, I still feel the theme of accuracy was present and far and above what many authors pass off as fact. I have seen my previous work deliberately misquoted by one owner, as part of their sales hype for the Export they were trying to dispose of. Ten years on, I haven’t encountered any serious efforts from Moke or Export people to sort out many of the remaining vague areas or simply start an accurate database for future use. I was most disappointed when the UK Moke Club’s Registrar couldn’t even be bothered to acknowledge my enquiry. As can be seen, I have thrown the odd detail on to the original article as data has appeared. I am yet to see an Export’s Compliance Plate wearing a CHOKE (Chinese pseudo Moke) body but, as sure as death and taxes, that will happen. This, of course, raises an entirely different issue for another paper. As a result of another stream of research I did end up starting my own Moke database. This was kindly supported by Richard Green at REMLR – hence a lot of the initial work was taken up trying to sort out the information found in the Army registration ledgers. Anyway, as before, when owners and clubs start openly sharing, collecting and collating accurate data, you can arrive at accurate conclusions. Owners who record and share accurate details about original features will undoubtedly be the only accurate source of information about Export Moke. Don’t let it become one! Having seen my work misquoted and misrepresented in the past; please recognise that the terms 11L, 12R, 13R, 14R and 030 as used in this paper, are abridged creations, solely for ease of reading. As a standalone abstract quote, they could just as easily refer to countless other BMC/LA products with NO Moke inference whatsoever! Article written by Mark Paget. Blog : Whither Rover’s return? You mention gold engines; at least in UK market, the gold was only for “Gold Seal” factory reconditioned engines. As “A” series engines blew up quite often, a gold engine was not uncommon to see. …and not uncommon for those golden engines to last even shorter. This was a point in the original article. As the article repeatedly identified itself as dealing with Australian production, the point was in reference to the use, by BMC-A, of gold metallic paint as a means of power unit identification. Other periodic specific colours including metallic green, blue and black. Plus metallic blue for some of the other products. This doesn’t have anything to do with UNIPART Gold-Seal exchange units, which didn’t arrive till years later and were not available in Australia. By time Gold-Seal existed, UNIPART was no longer an entity in Australia. LA did still stock UNIPART items as shelf lines as direct replacement parts supplied by BL. Well I don’t know about A-series blowing up, but it was hard to shift the nut on the crankshaft, which was torqued up to 150 lb.ft. We had one on a bench in a shed in Scotland, my brother applied a scaffolding pole and socket wrench to one end, while I applied the same low-tech tools to the other end. The nut didn’t shift, but the whole engine “levitated” off the bench! A great read that brings back a few memories working in Tweed Heads NSW (Australia) for a Leyland dealer, that also had a subsidiary company hiring Mokes out to the holiday makers up and down the Gold Coast. From memory there was also a hood and trim material which had zig-zag pattern and was called “Verve”, some Mokes had a denim-look vinyl as well. The 1275 engine versions were quite good performers actually, although I recall that the inner circumference of the front tyres tended to foul on the inner fender skirts on full lock, as legacy of the white spoked Sunraysia wheels that were fitted. We had issues with a couple of Mokes that were used by a local newsagent for paper deliveries, apparently the steering column inner shafts were knocking after a while, caused by the plastic shear pins breaking on the collapsible shaft. No other customers had the issue and it was proved to be from the driver heaving on the wheel while getting in and out of the vehicle. Not just Moke parts list but other BMC-A and LA documents inspired me to write separate papers on their workshop manuals and parts lists. In short a comedy of continuous company errors and apparent indifference, especially to those at the coal face. Not my best work and the site editor made a few changes which didn’t help. I still have two Dinky models of the MOKE… a green one & the white “Prisoner” TV version. Poor attempt at ambush marketing by the way. For some reason the system hasn’t allowed me to post a reply till now. As was evident from day one of CHOKE something like 12 years ago, it’s not a Moke and doesn’t meet the required design rules as either a replacement body for a Moke or a stand alone vehicle in itself. The only ones in Australia are hiding behind the identities of deceased Mokes. I would think it more likely that the power loss from emission control was proffered as justification, if anything. Otherwise some Engineer just ticked the relevant box stating that it complied with ADR and no one ever checked. I can remember a Mini Moke being the headmaster’s car in the 1971 comedy drama film Melody, featuring Mark Lester and Jack Wild. A little seen film now, my main memory is the rather strict headmaster’s choice of transport being blown up by his pupils when they stage an If style rebellion. I would have liked more detail in the content but facts are few and far between. 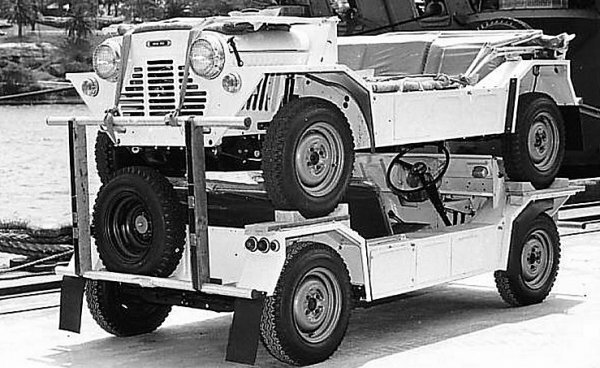 Was your Moke delivered new to a mainland state, through a U.S.dealership? I remember the first batch of “Export Mokes” having an extra pulley (i.e twin pulleys) between the engine and radiator. After much discussion in the club (Moke Owners Association of Victoria) as to what it was for, (and probably even more discussion on what we could use it for! ), we contacted the factory in Sydney and found it was originally going to be used to drive some kind of de-tox box. I was thrown out of a showroom in Melbourne when the first run of crumple Mokes arrived and I attempted to lift the bonnet to take a look inside, stupidly thinking I could do it in the centre like my 1966 lil wheeler. The bonnet bent either side of my finger and the salesman threatened to sue me, amongst a lot of other nasty things… Shortly after that the strengthening twin “lumps” appeared so I guess the factory was already aware of the problem! …and of course, the lumps got pinstripes to make them a “feature”! I’m not sure why you are focussed on bolt-on features. Have you looked at the date of compliance on the Compliance Plate or decoded the body number or assessed the precise structural features of your Moke?